Approximately 300 species are classed in the family Theraphosidae, commonly known as tarantulas. They reside in the arid, tropical and subtropical climates of every continent except Antarctica. With their large fangs and hairy bodies, tarantulas have garnered something of a horror movie–like reputation as dangerous predators. However, according to National Geographic, the bite of a tarantula, although painful, poses about as much danger to a human as a bee sting. North America is home to several species of tarantulas, most of them docile in nature. The Mexican Redknee tarantula, which can live up to 30 years in its natural habitat, is probably the most famous, having nabbed numerous scary cameo appearances in films like "Raiders of the Lost Ark" and several James Bond productions. Other North American species include the curlyhair, Martinique pinktoe, Costa Rican zebra, Mexican bloodleg and Costa Rican red. South America is home to the largest population of tarantulas in the world, ranging in temperament from docile to aggressive. The Columbian giant tarantula is unarguably one of the most entertaining spiders around, scaring off predators by bobbing up and down on its hairy legs, then spinning in a circle, swiping at its enemy with its long limbs like a tiny martial arts expert. 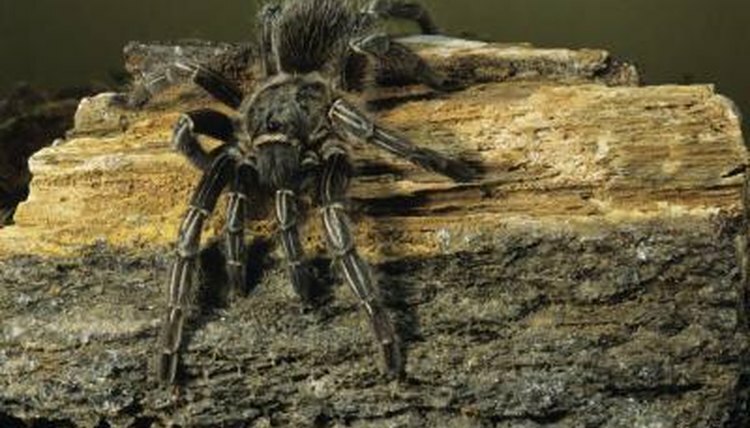 Other tarantula species common to South America are the Chilean rose, pinkfoot Goliath, Trinidad chevron and Brazilian salmon pink birdeater. According to Australian Geographic, the six known species of Australian tarantulas are often referred to as whistling or barking spiders because of the sounds they emit by rubbing their front legs against their jaws. They have also been dubbed bird-eating spiders, despite the fact that this rarely occurs. They typically feed on insects, other spiders, lizards and frogs. Africa is home to the very large and very aggressive king baboon tarantula. The king baboon can grow up to 9 inches in diameter, and preys upon large insects and mice. Its venom is believed to be more toxic than that of most tarantulas. The king baboon is known for its unusual defensive posture: when threatened, it stands up on its hind legs and emits a loud hissing noise. Asia is home to some of the most aggressive tarantula species on earth. The rare Malaysian earth tiger tarantula, according to David Sones' Tarantulas, will fiercely stand up to any opponent, regardless of size. The Thailand black tarantula has been dubbed "evil" and "ferocious" by tarantula enthusiasts, and even the young spiderlings of the beautiful cobalt blue tarantula have been know to display their tiny tempers.